My other major question has not been discussed in this specific thread. What else were the Vorlons shooting at when they took out Jha'dur?? As you can tell, I agree with the "The Vorlons don't miss!" school of thought. I've talked about this with a couple of people and one of my friends dug up some stuff from other forums (or maybe even here, I don't know ) that showed JMS agreed that Vorlons wouldn't miss, and that that meant they were indeed shooting at something else. So, what's up with that? A solid episode. I like all the stuff with the League, and the background we get on their relationship with Earth, and Earth history. Also the Vorlons being all ... Vorlon-ey. I also really like the stuff with Talia, although I would have loved to have found out more about what exactly was going on there in a later episode. Alas. There's several worker cast Minbari in the background in this episode. At least that's what they look like. It's interesting because they are never even spoken of until much later. There are definitely bits of dialog in later episode in which characters talk about the TWO castes of Minbari. I think there was some discussion elsewhere on whether there were originally only two castes planned, or if it meant that the warrior and religious castes just pretend the third caste doesn't exist. The fact that they're right there in the background leads me to believe it's the latter. What exactly IS "the hour of Scampering" and how did Talia figure it out? I'm guessing the details all got "emailed" to her or something. Everyone is so certain that that woman can't be Jha'Dur because the Dilgar war was 30 years ago and thus Jha'Dur should look older. Is everyone just intimately familiar with facts on Dilgar biology, like average lifespan and that sort of thing? Or is it just that all the younger races are pretty similar in terms of lifespan and aging, and thus one can make certain assumptions? "I can't match her species type" "Try the xenobiogenic files" ... What were you trying before? I love that bit where Jha'dur tells Sinclair that the Windswords talk about him and that he has a hole in his mind. I also really dig the warrior caste outfits, as I'm sure I've mentioned a few times. Not so crazy about Jha'dur's evil laugh. The Narn and the Centauri both collaborated with the Dilgar. Because of course they did. This was mentioned in the very first comment in this thread, but what's the deal with the Ipsha(?)? When those Vree ships come out of the jumpgate along with that .. other ship, my response is still "wait, who are they?" Personally I don't think there's anything in the Vorlons missing the first time other than they missed the first time. I checked the Other Voices script book and there is no mention in the script about the Vorlon ship missing (interestingly, the script calls the Vorlon ship a 'War Wing', maybe they had a different type of ship in mind?) so it might just have been something added in by the FX team. Even if they had been shooting at something else, nothing exploded so presumably whatever they were aiming at, they missed! The Deathwalker script also calls those Non-Aligned aliens 'Iksha', apparently fish-like in appearance with scales. I kinda liked their ship, and the Vree saucers, it was a shame we didn't see that exact type of Vree ship in the battles with the Shadows along with the other Vree saucers, just to maintain continuity more than anything else. 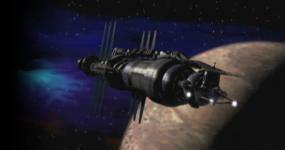 Same with the old Narn cruisers from season 1. The one caveat is that it's always possible that it was something JMS asked to be added in after the script was written. It could also have been a plot point that was forgotten after Michael O'Hare left and the story headed in a different direction. There was mention of the Windswords having sheltered Jha'Dur, and they were meant to play a big role in the original story, I think. Maybe they had a cloaked ship nearby? But then surely we'd have seen the explosion. Nah, I reckon they just missed. Actually, I kinda like the fact that they miss - there's a neat juxtaposition there, that the Vorlons present themselves as hugely advanced and god-like, and take it upon themselves to play god and kill Jha'Dur, and yet at the same time they show themselves to be imperfect by missing. Hints at a chink in their armour. When this debate came up a long time ago, I admit I just assumed the special effects team did the usual "Star Trek" kind of graphic for it. But I love the Jason Ironheart theory.